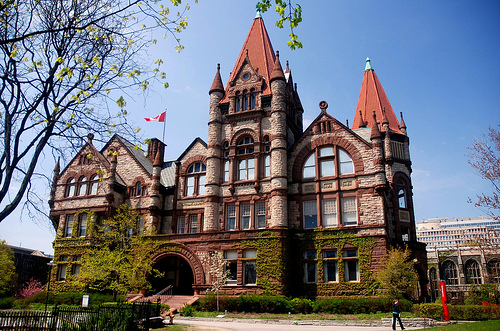 The University of Toronto is the oldest university in Canada and internationally renowned for its research and professional faculties. However, the research and prestige of a university do not always translate to a good undergraduate education. At its best, UofT is a cornucopia of limitless resources, brilliant faculty and world-class research. At its worst, UofT is a bureaucratic beast that entraps undergraduates with its difficult courses, harsh marking scheme and general indifference on student well-being. Here are some crucial things to know about UofT. When you are accepted into UofT, you are put into a stream of study in first year, but you are not admitted into your Program of Study (POSt) until second year. Many of these POSts have enrolment requirements, such as prerequisite courses and minimum grades, and some even require formal applications and interviews. It can feel like getting into university all over again. Huge first-year streams, which have been steadily growing over the past few years and are projected to keep growing, have made it more and more difficult to enter a competitive POSt. A notable example is the Computer Science Specialist: the minimum first-year grade requirement for the Computer Science Specialist POSt has risen from 50% in 2014 to 83% in 2018 . The trend at UofT is to have easy requirements to enter university, but hard requirements to enter your POSt. Of course, for UofT, this generates more revenue while keeping the programs high-quality and elite. As a result, it is common to see students taking five or six years to graduate, rather than the usual four. Arts & Sciences students at St. George campus are split into seven colleges, with each college acting as the primary provider of services for students, such as academic counselling, accommodation and scholarships, and also community activities., such as orientation week and socials. If you are looking to make friends and be involved in a community, your college is a great place to meet people from outside your program, as it is smaller and more intimate than the university at large. Although you are guaranteed a spot in residence as a first-year, it may not be the residence of the college you selected. You may have the misfortune of being relinquished to the far confines of Chestnut Residence. To control program entry, first-year prerequisite courses generally have a preordained range for class averages. In my experience, general first-year math courses have final class averages in the high 60s range, and that may be after a substantial portion of students have already dropped out. Although professors usually do not adjust grades downwards, they can choose to make final exams rather tough if the class average is too high. The good news is that a grade of 85 at UofT is considered to be a 4.0. Funnily enough, more advanced courses may be graded more easily and have higher class averages. Professors are willing to be more lenient given that harder material is taught, but keep in mind that students who take advanced courses are usually bright and ambitious. Be prepared for large class sizes. A general first-year course at UofT like Calculus and Biology can easily have over 3000 students, and a first-year lecture in Convocation Hall may have nearly 2000 students, which often leaves late students having to stand through the lecture! This is especially true for students in the Life Sciences stream, whose first-year course load consists almost solely of Con Hall lectures. The good news is that as you progress into your upper years, the courses become smaller and more specialized, some having just a handful of students. UofT, like other universities in Toronto, has a huge commuter population: A survey in Fall 2015 found that over half of UofT students commute (2). With rising rental prices in downtown Toronto, fewer and fewer students have the financial means to be able to live close to campus. Commutes of over an hour make it difficult for students to engage in extracurricular activities and social events on campus. Waking up early in the morning and always worrying about getting back home takes its toll on university life. In 2018, international students make up 22.5% of the undergraduate population and 16.8% of the graduate population. A stunning 65% of international undergraduates come from China, while the next largest group is India at 4%. The number of international undergraduates is projected to increase while the number of domestic undergraduates is projected to decrease (3). This is no surprise as international tuition is much higher than domestic tuition. If you are in Math, Stats, or CS, you may end up in the minority of domestic students and find it difficult to communicate with your fellow classmates, due to language barriers and cultural differences. The upside is that you get to meet people from around the world. In addition to the points above, the crushing academic atmosphere and lack of a secluded campus result in low school spirit. This is at stark contrast to small-town universities like Queen’s and Western which have strong school spirits and cohesive communities. Most UofT community activities are centred around individual colleges and faculties, and there, you will find tight-knit communities there. My advice for first-years who find themselves lost in the sea of students is to find small, local groups in their college or program and build from there. Large organizations like UofT are inherently bureaucratic and slow to get things done. For example, you have to jump through many hoops just to see your final exam, and many more to request a regrade. The system can be frustrating for newcomers who do not know how to navigate it. If you want to get into academia or go to grad school, start research early. Unfortunately at UofT, due to its focus on high-level graduate research, it is difficult to receive a research position as a first-year. Other schools, however, are more lenient. In the summer after my first year, I was able to receive an NSERC USRA at the University of Waterloo to do astrophysics research, which would have been tough even for second-years at UofT. In the early years of undergraduate research, don’t just consider UofT, broaden your horizons. For courses, know your limit and don’t bite off more than you can chew. Don’t take a course load that is completely overwhelming, as it will stress you and impact mental health, and the learning experience will not be enjoyable. UofT students tend to be rather negative about their school, their courses and their overall prospects. Don’t fall into the cycle of negativity, keep your head up and stay positive. Mental health comes first: UofT students are known to be prone to mental health issues. Remember, courses can be retaken, they are not worth the degradation of your mental health. Build relationships with your professors: reach out to them about coursework, research opportunities or simply to discuss interesting topics. Start tasks early, because things pile up. I found that simply printing the assignment as soon as I received it encouraged me to start working earlier. Be careful about skipping class, catching up after you’ve fallen behind is difficult and stressful. Use summers wisely – don’t do nothing. Personally, I was never a big fan of summer school, I preferred finding research work or an internship. Take care of your body. Healthy body, healthy mind. Eat well, exercise, and remember that UofT gyms are included in tuition. UofT is a research-oriented school that is tough on undergraduates. However, at UofT, you are exposed to world-class research environments and limitless opportunities. It’s’ up to you to take advantage of these resources. I had a great learning experience at UofT, but it wasn’t the standard university experience. To me, UofT was a place where I learned a great amount, made connections and started my career – that’s all. I don’t feel any emotional connection to UofT as a whole. In 2014, I entered the University of Toronto with a burning passion to study physics. Halfway through my undergraduate degree, I became disillusioned by academia and decided to pursue industry opportunities. In 2018, I graduated with a B.Sc as a Math & Physics Specialist and started a career in Data Science and Machine Learning.